"If I only knew as much as Abram S. Hewitt, I might amount to something." Abram Stevens Hewitt, iron manufacturer, Congressman, and mayor of New York City, was born near Haverstraw, New York, the son of a cabinetmaker. After attending public schools, he entered the Grammar School at Columbia College at the age of thirteen. Three years later he won a scholarship to Columbia College, where he ranked first in his class in academics. Upon graduating in 1842, he began the study of law while also teaching mathematics at Columbia’s grammar school. At this time he tutored Edward Cooper, the son of inventor and manufacturer Peter Cooper. In 1843-1844, Abram and Edward took a trip to Europe. On their return journey, they were shipwrecked. This harrowing adventure strengthened their friendship, and afterwards Hewitt was regarded as a virtual member of the Cooper family. 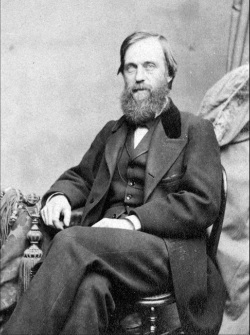 In 1855 Hewitt cemented his relationship with the family when he married Sarah Amelia, Peter Cooper’s only daughter. The couple had six children. Abram S. Hewitt and Edward Cooper assumed the responsibility of managing and expanding Peter Cooper's ironworks at Trenton. The two friends formed a partnership, Cooper, Hewitt & Co. The new firm became the sales organization for the products manufactured by the Trenton Ironworks. Trenton's principle product was iron rails. This was a very lucrative business, supplying the railroads as they expanded westward. Trenton was the pioneer in developing iron beams, the forerunner of the modern steel I beam. Eventually, wire and structural beams for buildings and bridges became the principal products. 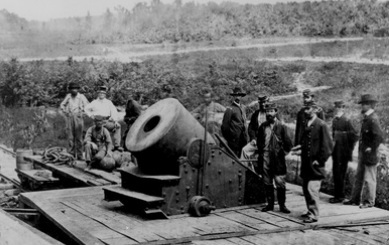 Hewitt was a strong supporter of the Union cause during the Civil War. Shortly after the war began, Hewitt set about supplying gun metal, essential for the manufacture of rifles, to various armories, including Springfield and Watertown. Late in 1861, Cooper, Hewitt & Co. received an order from the Navy Department for twenty-one mortar beds to be completed as soon as possible. The beds were extremely difficult to build as they needed to be strong enough to withstand the devastating recoil from the mortar. Hewitt personally supervised the contract and fulfilled it by January of 1862. Only a few weeks later, Hewitt received an order from the Ordnance Bureau for thirty mortar beds to be completed in thirty days. Hewitt again supervised the production and managed to ship all thirty in only three weeks. Abram was tasked with scouting the Ringwood estate in order to insure an adequate supply of iron ore was available for the expanding company. In describing the Ringwood mines, Hewitt said they were "the best I have seen." Eventually, Abram brought his young wife, Amelia, to visit the property and small Ryerson home on it. Mrs. Hewitt immediately fell in love with the Ringwood property, so much so that she decided to turn it into the family's summer estate. Though it was their legal residence, the family really only spent summers at the site, since Peter Cooper enjoyed having his daughter and son-in-law living with him in New York City. The Ringwood estate soon was expanded into a comfortable and warm home. The Ringwood residence made an ideal summer home for Hewitt's growing family and hosted a wide range of family, friends, and business associates. While much of the property continued to be utilized for the mining business, the area in the immediate vicinity of the home became a beautiful estate snuggled in the valley between Waleback and Hope Mountains on the east and the Ramapo Mountains on the west. Abram Hewitt was a lifelong Democrat, and by the early 1870s his interests began to shift from manufacturing to politics. Together with his brother-in-law, Edward Cooper, he helped topple the corrupt Tweed Ring and reform Tammany Hall, the New York Democratic organization. In 1874, Hewitt was elected to the US House of Representatives in New York's 10th congressional district and served for ten of the next twelve years. As a Congressman he favored moderate tariff reform and sponsored legislation that established the US Geological Survey. 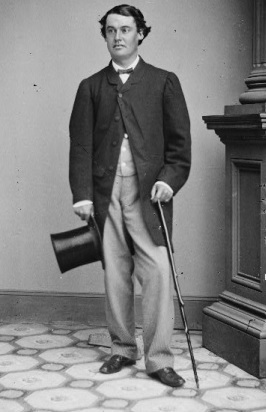 In 1876, Hewitt was the chairman of the Democratic National Committee and managed New York Governor Samuel Tilden's unsuccessful run for the presidency. It was one of the most highly contested presidential elections in US history, with a victorious Rutherford B. Hayes announced in March of 1877. Two years later, the disgruntled Tammany boss, John Kelly, deprived Hewitt of renomination to Congress. Hewitt and Cooper retaliated by joining with others in founding a rival party known as the County Democracy. Hewitt was re-elected to Congress again in 1876, 1880, 1882, and 1884. During that time, Hewitt gave the dedication speech for the opening of the Brooklyn Bridge. In 1886, Hewitt's career took a new turn when he accepted the Democratic nomination for mayor of New York City. His opponents were Henry George, running on the United Labor party ticket, and a young Theodore Roosevelt, the Republican candidate. In order to thwart Henry George, both the County Democrats and Tammany Hall joined forces to support Hewitt. On election day, Abram Hewitt handily defeated both of his opponents. As mayor, Hewitt sought to bring honesty to the administration of the city and eliminate corruption. In the process, he became involved in battles with Tammany Hall politicians by refusing to appoint some of their men to public office. He became the enemy of saloon keepers when he began enforcing laws that prohibited saloons from operating on Sundays. Hewitt further outraged some New Yorkers with his views on Irish immigrants, refusing to take a place in the reviewing stands at the St. Patrick's Day Parade of 1888. In a heavily Irish city, this decision proved very unpopular and contributed to Hewitt's defeat for re-election in 1888. Though Hewitt left office in 1888, his popularity among the citizens of New York remained for years to come. His persistent dedication to create, maintain, and improve small parks throughout the city was well-received. He also urged the development of an underground mass transit system, which eventually led to the creation of the subway system. Finally, Hewitt was a staunch supporter of improving road conditions and adding electrification throughout the city. Abram Hewitt continued in his father-in-law's footsteps in devoting much of his life to philanthropic causes. He was instrumental in the development of the curriculum at Cooper Union, giving advice to Peter Cooper about education based on his own experiences from Columbia College. He also was a staunch proponent of women's education at Cooper Union and the expansion of opportunities for them in business and industry. During the decade before his death, Hewitt endeavored to make sure that the college was on solid financial footing, often looking to friends and associates for donations. He himself would donate a vast amount of his own fortune to help maintain its tuition-free status. Aside from his involvement with Cooper Union, Hewitt was an avid supporter of Columbia and Barnard College. He sat on several foundation boards and was an administrator of several large trusts, including the Carnegie Trust and the Beecher Foundation. Abram S. Hewitt died peacefully at his New York City residence on January 18, 1903 at the age of 80.